It’s that time of the year again when we all get to feel pressured into spending lots of money on people we don’t care about and buy a bunch of superfluous gifts. Ok Christmas time isn’t that bad, but it’s kind of like a nightmare for a lot of personal finance bloggers. I actually enjoy spending money during the holidays though. I look at it as an opportunity to deal hunt and try to save as much money as possible on the things ‘I have’ to buy. That part of Christmas is pretty fun for me. Cyber Monday was kind of a bust this year and the only thing I ended up buying was a personal water filtration system, you know just in case there’s a zombie apocalypse(I’ve been watching a lot of Walking Dead lately). But there is one item that I always look forward to buying around this time of year and that is a Christmas tree. I love coming home to the smell of fresh pine after work and seeing a bunch of presents under my tree. But just because I enjoy having a nice tree doesn’t mean I’m going to pay top dollar for it. Here are some of the best options I’ve found when it comes to buying a tree this holiday season. You’ve probably started to notice temporary tree lots popping up around your neighborhood lately. They usually get going just after Thanksgiving and they are often the most convenient option when it comes to buying a tree. These lots tend to have a pretty decent selection but you can count on paying a nice price premium for that convenience. Most tree lots charge around $10 per foot, so if you plan on getting a 6-7′ tree, you should expect to pay around $60-$70. A lot of these local tree lots do offer coupons though so keep an eye out for mailers or flyers around your neighborhood. Some lots will also offer a discount or a coupon for repeat customers so be sure to ask about that. I’ve never gone to a Christmas tree farm to get my tree but I’ve heard it’s a lot of fun. You will probably pay in the $10-$15 range per foot but being able to pick a fresh tree and watch it get cut down is worth the extra cost in my opinion. I’d probably even make a whole day out of it with my family or friends since it’s not something you get to do every weekend. Use a site like Yelp in order to find a farm with the best trees and prices in your area. Typically, these farms are out in the wilderness or mountains so if you live in the city you will probably have to drive a ways to get there. Ever since I discovered that Home Depot sells Christmas trees I’ve been a loyal Christmas tree customer of theirs. Keep in mind though that buying a tree here won’t be as convenient or easy as a tree lot, you’re going to have to work a little for your tree. The trees are all wrapped up so you have to unfurl them yourself, I usually bring a box cutter or borrow one from an employee. When I went the other night, the Home Depot staff was out helping people load the trees onto the roofs of their cars but I’m not sure if every big box retailer will do that. I ended up buying a 5-6′ Douglas Fir for only $22. They also had 5-6′ Noble Firs for $35 if you prefer that style. Home Improvement stores and mega retailers might not be your first thought when it comes to buying a Christmas tree but they always have the best prices. If you want to save even more money there are lots of promotions this time of year that you can try and use. Lowe’s, Costco and Walmart are all having AMEX Sync deals right now so you could easily save an additional 10-20% on your purchase. And don’t forget about the 10% off Lowe’s home mover coupons. They can usually be found in USPS change of address packets or you can buy them on eBay for about a buck a piece. Most Home Depots will match this coupon too so you don’t have to shop at Lowe’s with the coupon if you don’t want to. The last option and the lamest in my opinion is to get an artificial tree. These trees will run anywhere from $100 to $1,000 if you get a really nice one. But you can also find some good bargains on Craigslist for artificial trees. I think having an artificial tree kind of defeats the whole purpose of Christmas but if you have allergies or tree-hungry pets you might not have a choice. Readers, where do you like to get your Christmas tree every year? Do you know of a cheaper option than going to a big retailer like Home Depot or Walmart? Ours comes from Home Depot, which luckily is just a couple of miles from our home. We went and got ours last night and it’s a gorgeous 7ft tree that is beautiful and so full! $40 well spent! Nice, I remember the first time I went to Home Depot. 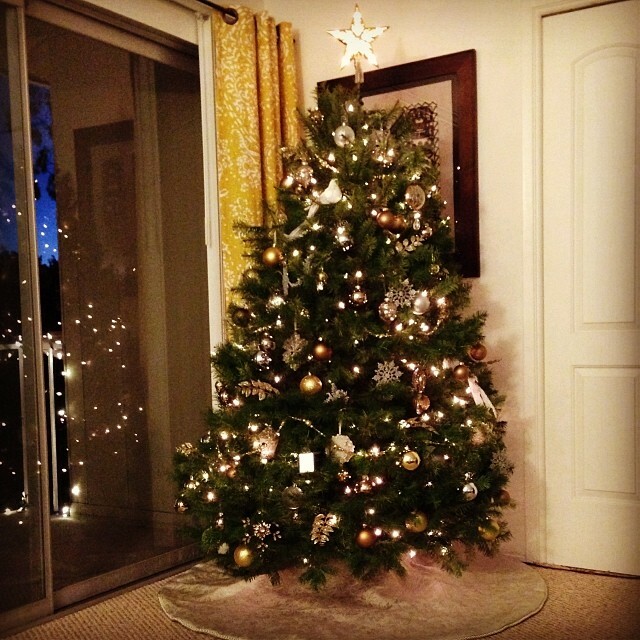 The trees were so cheap, we ended up getting a massively wide 7-8′ tree. It was the biggest tree I’ve ever seen but so awesome! I’ve always preferred the real trees, but my wife doesn’t like the mess or the fire hazard that comes along with having a real tree. Because of that we bought a nice looking artificial tree (they do exist!) at Home Depot. We made sure to use all the coupons/discounts we could find. Not as cheap as a real tree, but we’ll use our new 7.5″ artificial tree for years to come. Ah gotcha, yea I’ve seen some nice artificial ones. And although the upfront cost is a little more they obviously last for many years. Allergies have killed any chance my husband or I can ever have a real tree, but I don’t think artificial trees are necessarily that bad. The best ones are pretty expensive, but if you shell out the money up front, they can end up saving you money in the long run because you don’t have to buy a new one every year. My hubby’s parents spent a couple hundred bucks on a nice artificial tree that they ended up having for around fifteen years. The only thing that can be difficult is storage; if you don’t live somewhere that has sufficient storage space, a disposable tree might be your best bet. I actually bought a new Christmas Tree this year at Sears and got it for $134 but I got one without all the lights since most of them go bad every few years I figured it would be easier and cheaper to get one without and I was right. Most other trees ran around the $200 plus range and more. Nice, forgot about Sears but I’m sure they have some good deals on trees too. Jinx! I published a post today about our $20 Lowe’s tree too 🙂 It’s our first time buying our tree there and I’m pretty happy about it. Haha, who’s was first?? Yea $20 trees are the way to go, I’m hooked.